A super flexible and powerful tool to create lovely themed Chinese writing paper for use in your classroom or at home. With a clip art image from your online picture repository, your social media pages, or anywhere on the internet, you can quickly create fun and cute themed writing pages for seasonal activities. 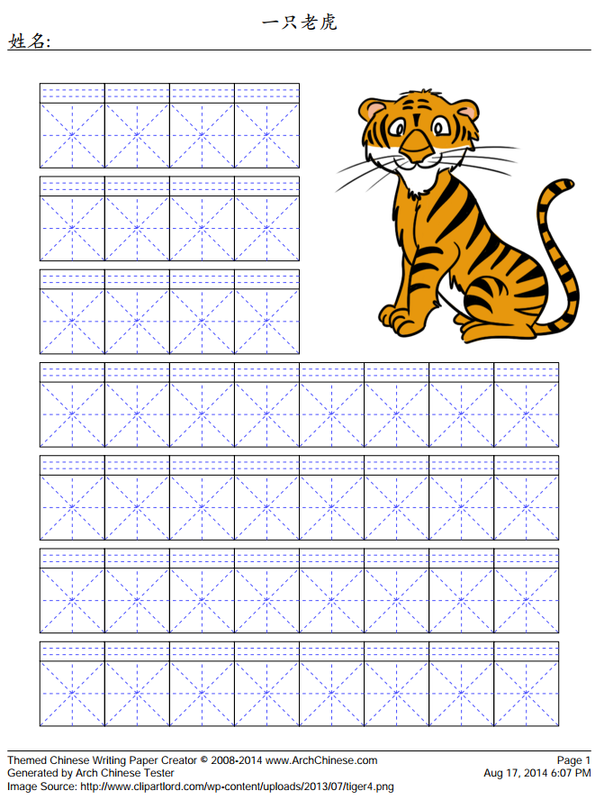 You can also use the writing paper to supplement a Chinese lesson that focuses on a school or back-to-school theme. 1. Click the Load Image button to load the theme image you would like to use. Alternatively, click the Search Image button to search an image from the images uploaded by you or other Chinese teachers. 2. If you use an image that you don’t own the right to, you should give credit to its source. You can enter something like "Image by (name of author, or link to the source)" into the Image Credit box. The credit will be shown on the footer of the generated writing paper. 3. Large or super high resolution images may increase the upload time and the writing paper generation time. 6. Writing Grid Size: 15 20 25 30 35 40 45 50 55 60 65 70 75 80 85 90 95 points (one inch equals to 72 points). 7. Space Between Writing Grid Rows: 2 4 6 8 10 12 14 16 18 20 22 24 26 28 30 32 34 36 points (one inch equals to 72 points). 8. Pinyin Grid Height: No Pinyin Grid 6 9 12 15 18 21 24 27 30 33 36 39 42 45 48 51 54 points (one inch equals to 72 points). 10. Writing grids flow around the image. 11. The writing grid section takes about 10 15 20 25 30 35 40 45 50 55 60 65 70 75 80 85 90 95 percent of the page space. The image will be resized accordingly. 12. Generate additional 0 1 2 3 4 5 6 7 8 9 10 blank page(s) for writing.